One of the hottest trends in home décor, Mid Century styles are available in furniture, pottery, and lighting. 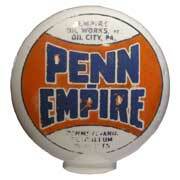 Find collectibles from iconic designers like Heywood-Wakefield and Eames for the Mid Century Modernist. 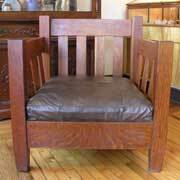 Looking for fantastic craftsmanship from the Arts & Crafts movement? 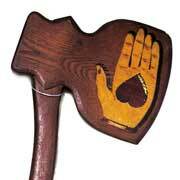 With names like Bradley & Hubbard, Roycroft, Stickley, E.T.C. Fish, Roseville, Rookwood and Fulper, connoisseurs will be sure to find the right piece of pottery, lighting, or furniture with a lasting legacy and heritage. 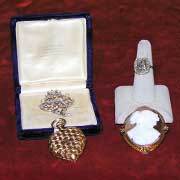 Experience the heritage of the Victorian era with antiques from the Eastlake Period and the Gothic Period. Glassware, furniture, and lighting comprise our Victorian antiques, a collection fit for Queen Victoria herself. “They don’t make ‘em like they used to!” Celebrate Early American hand-made traditions of craftsmanship in our Primitives antique collection that includes Spatterware, Flow Blue, and Blue Sponge. 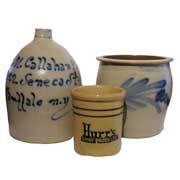 Also includes architectural wares, crocks and jugs. 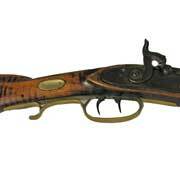 Collectors will find desirable pieces mingled among our ever-changing inventory of antique guns (pre1898), military, knives, swords and bayonets. 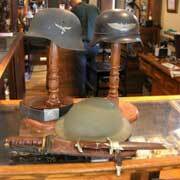 For the military enthusiast, we have an ever-changing collection of original, period and historical treasures from the Civil War, WWI and WWII eras such as weapons, knives, swords, webgear, posters, and trench-art to add to your military collection. Our Native American collection is comprised of traditional, practical and intricate pieces including artifacts like blankets, arrowheads, jewelry, and art from tribal peoples North to South and East to West. Cowden & Wilcox, Sipe, Nichols & Co., and Sipe & Sons, are just some of the names you will recognize when browsing to find the perfect piece of stoneware for your personal collection. Callahan's proudly offers a wide and diversified array of fine and costume jewels from every important design period including designs by Weiss and Eisenberg. Browse our constantly changing estate jewelry display of vintage engagement rings and wedding sets, precious metals like gold, silver or platinum, and precious stones like diamonds and gemstones. 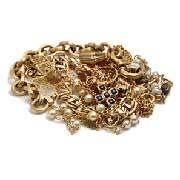 Of course, we are active jewelry buyers, diamond buyers, and scrap jewelry buyers. One of the hottest trends in home décor, Vintage 1950’s and Vintage 1960’s styles are available in furniture, pottery, and lighting. 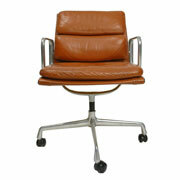 Find collectibles from iconic designers like Heywood-Wakefield and Eames for the Mid Century Modernist. Our quality Art Deco antiques include lighting, jewelry, purses, and furniture for the collector who appreciates the signature design of the 1920’s and 1930’s. 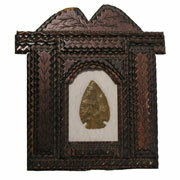 Distinctive and intricate Oriental antique ivory, jewelry, and swords are found in our collection. Because the nature of Oriental antiquities presents a high chance of replicas and copies – our certified appraiser always ensures authenticity. What specific area of advertising do you fancy? Metal, Wood, Neon, Petroleum, or pre-1960. Callahan’s is sure to have something rare & unique, maybe even local, to add to your advertising collection. Design and decorating excellence always lies in the details. Antique architectural elements such as fretwork, fireplace mantels, iron fencing, and decorative iron & wood have an ability to give a room, garden, or building a look with unexpected, vintage charm. There are many ways to purchase investment grade gold and silver coins, bars, and rounds, but using a local, reputable dealer is always the best. 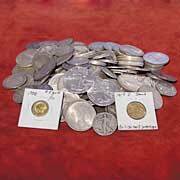 Please stop in to see a wide range of the most popular coins available and take advantage of our competitive pricing. 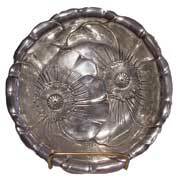 It’s impossible to keep up with the Jones’ unless your table and hutches are adorned with antique sterling silver. From flatware and hollowware to jewelry, come peruse our extensive collection, which changes weekly. Michael Callahan, a licensed scrap gold and silver buyer, will pay cash for your gold or silver no matter its condition or form. Rest assured that the certified scales are onsite and your items will be weighed in your presence. 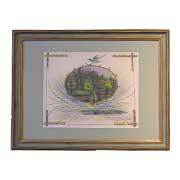 Looking for unique framed artwork? Callahan’s Antiquities is filled with a diversified collection of original oil paintings, watercolors and antique prints.